So that wish for every first responder to be safe was the inspiration for my new campaign. I’m challenging every firefighter to start each day, shift, or station meeting, with the pledge Because… and give a REASON they are going to do something that day they don’t often remember to do, or don’t want to do, or often overlook. Because I love my kids, I am going to check my gear after every call to make sure I come home safe. Because I love my wife/husband/significant other, today I am going to buckle up. When disaster strikes, it’s an accident if it was unpreventable – it’s a tragedy if there’s an excuse. Who wants their friends or family to hear, “it happened cause he/she didn’t/forgot……”? So start your meeting with everyone writing on a board their reason that month. Or put a note by your locker or by your family’s photo with your Because promise. Write “Because…” on your hand or your helmet as a reminder to take a little of your time TODAY to get a safety chore done. P.S. I would love to hear some of your pledges. I’ll post some of the responses to inspire others. Please help me spread the word BECAUSE…. because I want everyone to be safe. The author Colton Matthew, a high school student, has been involved in fire prevention activities since age 6. This February, Goshen Fire Company Fire Police members took part in a tabletop exercise - constructing scenarios related to traffic incidents & fire company response. By recreating recent traffic accidents and using tools like Google Maps, we can review traffic flow to minimize disruptions to ensure responder and public safety. Thanks to Cumberland Valley Volunteer Firemen's Association, Emergency Responder Safety Institute and Aetna Hose, Hook & Ladder Company for the training tools loaner. 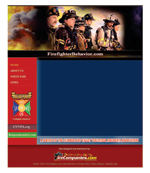 Saturday March 30-Noon to 5:00 p.m.- Emergency Services Behavior Health and Suicide Awareness Workshop led by Jeff Dill, Founder - Firefighter Behavioral Health Alliance. I hope I look that good at 80. I am 71 with 42 yrs on the Liberty Twp VFD in Selma Indiana. Iam the Safety Officer and Chief Inspector. Happy belated Birth Day. As I tagged Jay Sharpe when I see Charlie he’s always been Smokey the Bear! And he always been there for the Shippensburg Fire Service. Wow 80th what change he has seen! One hundred years ago, on August 15, 1901 fire chiefs from the States of Pennsylvania, Maryland, Virginia, and West Virginia met in Chambersburg, PA for the purpose of adopting a uniform hose coupling and to develop a mutual aid system along the Cumberland Valley Railroad.